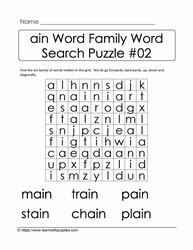 Looking for ain word family and rhyming word activities? 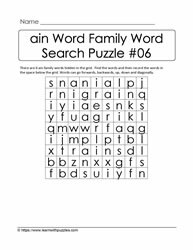 Here are ain word family activities to support students' vocabulary and language acquisition. 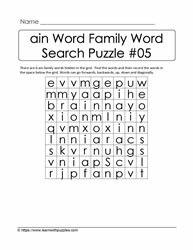 This group of ain word family and rhyming words puzzles contains 4 sets of word search puzzles for learners. 4. 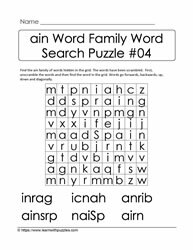 Word search puzzle with clues, or hints. 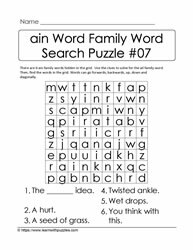 Students need to solve for the hints, and then find the words hidden in the grid. 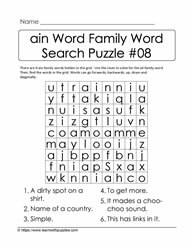 Each group of word search activities uses the same list of ain words, except that the lists have been randomized to help consolidate learning. 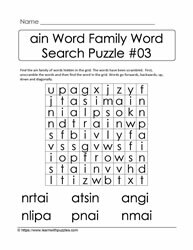 Suitable for home schoolers, primary grades (1-2), and English language learners in the classroom. Differentiate for instruction depending upon needs of students. 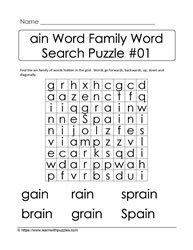 For example: K students might be able to complete some of the word searches while grade 3 students might need practice with deciphering puzzle clues.